Bug eating plants, says Hillsborough County Extension Yard and Garden Agent Lynn Barber, have adapted to nutrient-poor environments in water and on land. Florida's 17 documented species of bug-trapping plants grow in or near swamps, marshes, ponds and wet ditches. Easy-care bog garden plants, they survive hard freezes and live on rain or distilled water and the food they catch. Threadleaf sundew (Drosera filiforomis) belongs to a group of tiny plants with unusual leaves. This perennial has stringy, pinkish leaves rising from a basal clump. Their hair-like glands release sticky secretions to capture bugs attracted to the plants. The insects’ struggles trigger the glands to envelope them more tightly, reports the Lady Bird Johnson Wildflower Center (LBJ WC). The plant’s digestive enzymes then break down the insects. Its roots store some of the bugs’ protein. Threadleaf sundew’s leafless stems bears single yellow spurred blooms between February and May. Plants grow wild in the state's acidic (pH below 7.0), sandy, wet coastal soils. Yellow butterwort (Pinguicula lutea) is one of six of this plant species native to Florida. Butterworts grow close to the ground, with a rosette of pale green, oval, upward-curling leaves. Like sundews, butterworts have tiny glandular leaf hairs that release a sticky, bug-trapping substance. Perennial yellow butterwort stands up to 20 inches high. From February to May, it can have many leafless stems, each bearing a single, spurred yellow bloom. After its sticky leaves trap bugs, they secrete digestive enzymes. They also absorb their meal's nutrients. Yellow butterwort, reports the LBJWC, grows wild in coastal Florida's wet grasslands and open pinewoods. It needs full sun and acidic, moist infertile soil. 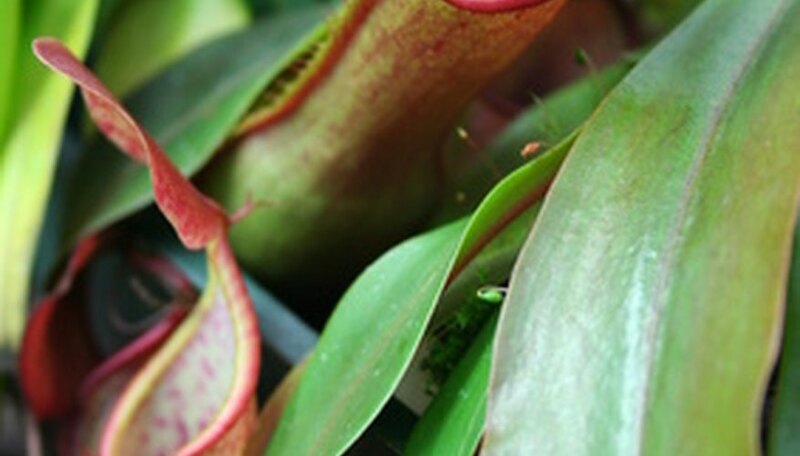 The Sarracenia species of bug eating plants is indigenous to North America. Plants are recognizable for their funnel-shaped leaves. Downward-facing hairs line the leaves' slippery interiors. The leaves also contain a tranquilizing liquid. Insects that crawl into them slide down the sides and drown. The pitcher plant then secretes digestive enzymes. Crimson pitcher plant (Sarracenia leucophylla) is native to the state's sandy bogs and one of Florida's seven Sarracenia species. Reddish-purple veins against a white background and a wavy hood, says the LBJ WC, top its clusters of distinctive leaves. The leaf funnels also contain nectar to draw insects to the plants. In March and April, crimson pitcher plant has reddish-brown flowers.